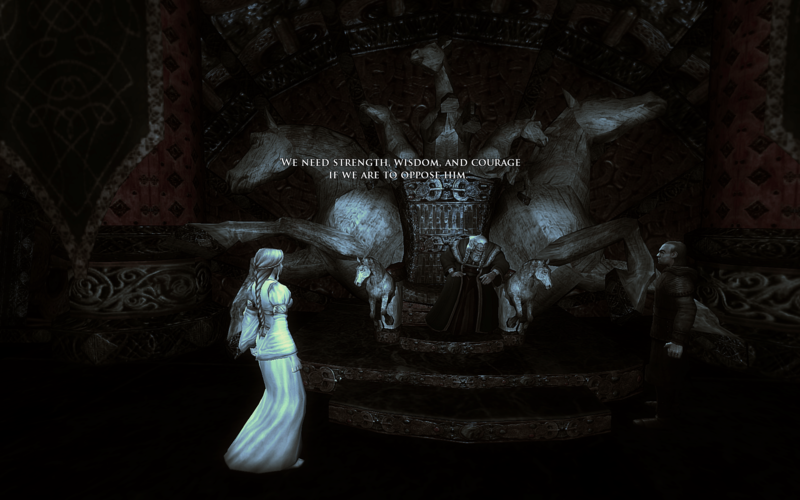 In my “bounce around in many titles” mood and mindset I did go back to Lord of the Rings Online. As mentioned here (often) but worth the review – the Warden is a class I strongly identify with thematically. I had big issues with the fact that you couldn’t play the Warden without the expansion even though there was no new starting area for them – and that turned me off of trying back in the day. Still, I actually invested in the opportunity in 2014 finally, got to level 5 on a human Warden, realized that at some point I would want to head West so rerolled an elf (my true calling, sorry Syp!) and didn’t get out of the “tutorial area”. Around level three. At the time I didn’t even know it was a tutorial area until just last night it told me “finish other quests before this one because this one takes you out of the tutorial area”. Clarity is a benefit. The graphics are not, of course, and there is a weird, floating movement I feel (and find) just running around doesn’t feel natural. Combat seems to play out that everything is off the global cooldown – so when I am trying to get a Warden combo in it’s special attack / auto attack / special attack / auto attack / finisher. Feels like it would be smoother if I could skip the auto attacks. It’s not terrible, of course, just something I noticed felt off that I was waiting to do things while things were just being done automatically. I was being harshly unfair when I noticed that her lips weren’t moving when she talked in the dream sequence. It looked unnatural. Then, OF COURSE I remembered that she didn’t speak out loud in the dream sequences in the movie either. I don’t even remember which came first. I definitely don’t remember if she mind-spoke in the book or not. Either way, at that point, I was able to be proud of them for sticking to the movie script and then unsure which came first. 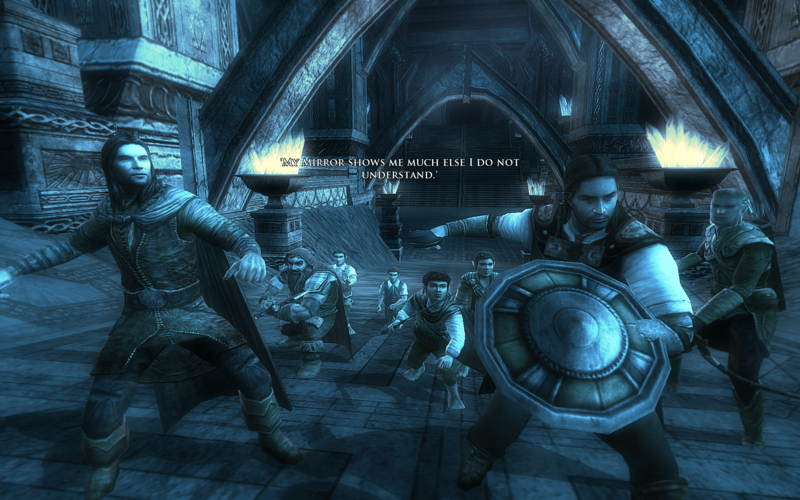 Maybe the movie copied LOTRO? 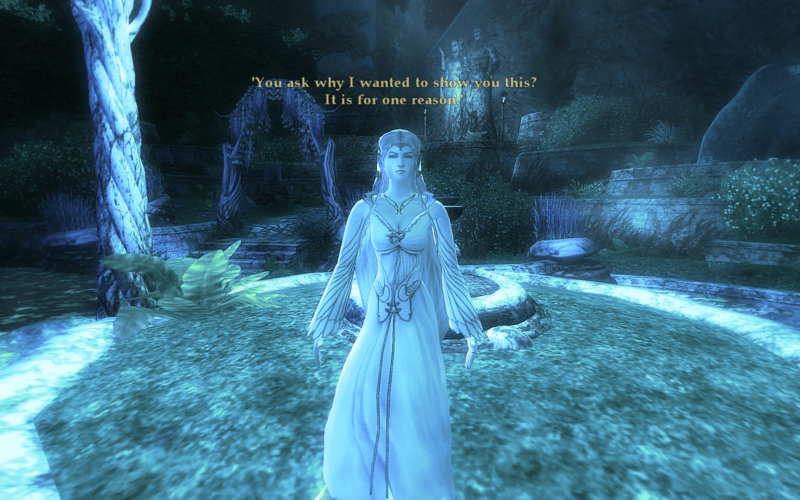 This part of the pre-tutorial ending dream sequence is the bit that made me go AHA! and remember that in LOTRO, you aren’t the hero. You are the supporting cast. This is a new territory to be explored in common MMO land where I have saved the world a thousand times (or every time?) in most other games. I actually appreciate that of the game but still thought it would be nice to support directly. Perhaps I do get to at some point. I hope I get there. Bonus points to hit to other popular and big plot points in Middle Earth just to remind you what is going on. While I just recently (last paragraph) mentioned that I didn’t mind being the second fiddle, at the same time it is hard to play a story out when you already know how it ends, no? No matter what I am doing there is something much more important going on and no matter what I do, the outcome is already concluded. The movies are already out! Is that stuff Canon yet? Now I feel less comfortable with that position and whether that is a good thing or not. Perhaps they should have gone pre Lord of the Rings and hit the major conflicts not covered in the movies (books. I mean books. I did read them. When I was 12.). None of this matters of course. Just thinking out loud. I just got off a 7.5 hour flight from france and now on a 2 hour train ride to get home. The final instance is not all dream sequence (however) and we do get to try and stop a necromatic event. The exciting part here (of course) is seeing Dwalin from the Hobbit’s Journey! The second trilogy movies that made him really famous. Again, I find myself happy to see a familiar name and then back to pondering timelines between LOTRO expansions and movie releases (while still not being bothered enough to google it to find out for myself. More fun trying to guess / sort it out. Then the map, of course, which is one of the most unfriendly maps to use I have seen in pretty much anygame in the last decade. 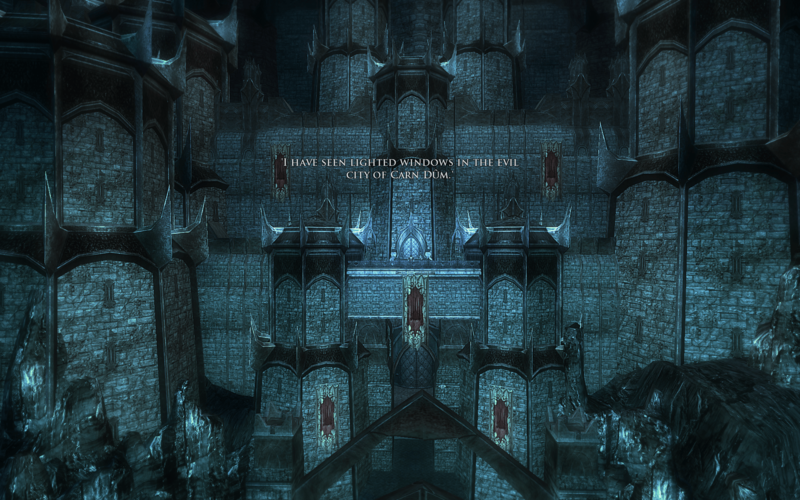 That is fairly explained that LOTRO is over a decade old. I will, of course, give it props for having a great style to it though. Feels like a King’s Quest map, if that game had any. All in all, despite the tongue-in-cheek post I actually had a lot of fun. There is so much comfort in the levelling game and early levelling is always the most fun. Not sure of the staying power here, but I will dip my toes back in much quicker than the four years since last time. 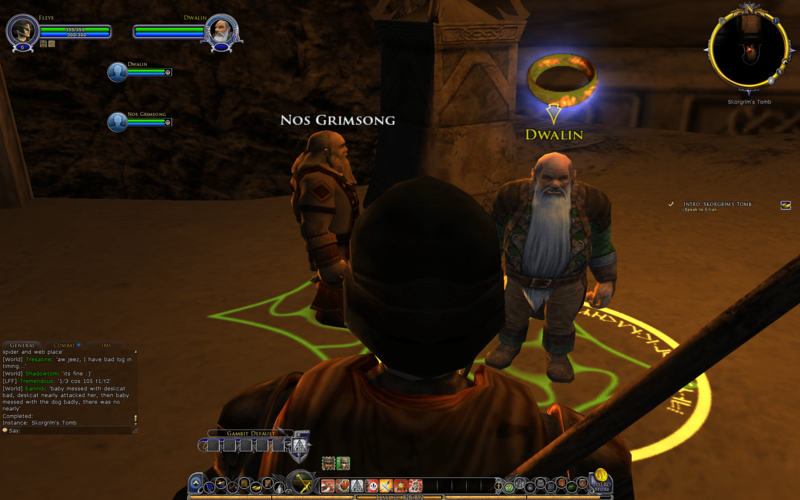 It’s good to see you giving LOTRO another try. I’ve been doing that as well and am enjoying the early levels as a Warden – I just chose a Human rather than an Elf. The Human storyline gets too play around with Strider instead of Dwalin but I agree, just seeing myself on the screen, in the world with such a legendary figure has been fun. I think it’s funny you mention how crappy the map is…it actually makes me think of old world maps primarily because it seems to be more for ornamentation than to provide any useful hint at where things actually are. What I find even more amusing is that just as I would love to be able to drill down into the map to get a closer view of things, I’ve actually seen people trying to zoom in on paper maps in the real world. It’s really funny to see them pinching and spreading their fingers on a Thomas Guide. I hear you there, somehow though I’m listed as a Premium account and I’ve got a bunch of LOTRO coins or whatever they call them…guess I’ll use em till they run out…starting with the expansions. I guess it’s a gift from my previous self.